Bose QuietComfort 35 review | What Hi-Fi? For a decade, Bose’s QuietComfort noise-cancelling headphones have been friends in need for keeping crying babies, droning transport and office hum far from you and your music. And the Bose QuietComfort 35 does all that with the extra benefit of being wireless. Now superseded by the QC35 II, these original Bose wireless noise-cancelling headphones remain a solid option, especially if you see a good price. While the development from the QC15s to the QC25s focused more on nominal improvements in sound and aesthetics, this time it is features at the forefront of the QC35s evolution. Of course, the famously effective sound-sucking noise-cancelling remains. Microphones inside and outside the earcups work to block external noise as effectively as ever. But headline news is the addition of (non-aptX) Bluetooth for wireless listening, alongside NFC for one-touch pairing. MORE: Bose vs Sennheiser vs Sony: which are the best wireless noise-cancelling headphones? Piling on yet more convenience points is its long-awaited abandonment of the AAA battery. Finally, Bose has entered the 21st century by implementing a built-in rechargeable lithion-ion battery with a claimed (and generous) battery life of 20 hours. That would cover you for a flight from London to Canada – and back again. Through the wire, using solely noise-cancellation, that battery life doubles to 40 hours. That means, in place of a pocket in the right earcup for a battery, there is now simply a small micro USB slot for charging. Much neater. A silhouette drawing of the QC35s and their predecessor wouldn’t be enough to tell the two apart – the oval Bose-brandished ear cups and chunky headband that define the QuietComfort line’s signature look are back again – but that’s not to say there aren’t differences. Sensibly, small design changes have been made to accommodate the wireless functionality. The power button on the right ear cup now doubles as a Bluetooth pairing button – simply slide it right across to initiate pairing. You’ll also spot a NFC tag and three buttons down the side, the third of which replaces the previous in-line cable controls. The middle ‘multifunction’ button plays and pauses songs, answers and ends calls, and can also initiate voice commands such as Siri or voice dial. Either side of that are two volume buttons, slightly raised so you can feel your way around the buttons without needing to take the headphones off to look. The partly suede headband features leather instead of cloth material now too, and to us the cushioning underneath the band feels plumper. That may be to soften the blow of the QC35s’ 100g weight-gain – no doubt a repercussion of the wireless internals. They still feel lightweight to hold and wear though, and the familiar ear pads are still some of the comfiest in the business, providing a good and snug seal without causing any discomforting warmth. The all-black and all-silver finishes look a little less interesting than those of the QC25s, which are the more likely of the two to win a beauty contest with their coloured accents. Generally, though, they are similar looking things, and both build and finish quality are just as pleasing. The QC35s can now draw extra functionality from the Bose Connect app – free for iOS and Android devices. This lets you manage paired devices and switch between them automatically; change volume; see the battery status; and tell them when to sleep – and all on an interface that’s clean and responsive. It doesn’t seem to have much more purpose than that though – there’s no EQ setting, for example – so those who would rather use their own two hands for those functions may still want to download it to check for, and perform, software updates. You need only go as far as a wired comparison with the QC25s to hear that the £20 price hike is justified. Taking their predecessors for detail, dynamics and clarity, the QC35s pull everything in a song that much more into your attention span. Play Billy Bragg’s Levi Stubbs’ Tears and there’s greater texture and clarity to opening guitar plucks and scratchier strums later on, and more insight into the twanging bass and resonating vocals. Shakers are more distinct, and the soundstage feels a touch more spacious and open too. The balance has changed paths slightly. While still precise and agile, with good control and detail across the frequencies, the QC35s are a bit brighter and less forgiving, so will be the first to flag up use of poorer kit or low-res files, from Spotify for example. If you have experienced the QC25s’ noise-cancellation and think it can’t get any better… you’re probably right. The new Boses match their predecessor for sound-sucking ability, which is still the best we’ve come across (by a fair margin) and puts you in a realm of isolation you’d only otherwise experience locked in an anechoic chamber. Yes it’s eerie to begin with, but you get used to it. Bose knows how to do wireless headphones – its AE2w and Soundlink models have garnered reasonable success – and we’re pleased to report that it’s pulled off a happy marriage with wireless and noise-cancelling too. Bin the wire, and while there’s a drop in refinement and transparency (as is often the case with wireless performances) they’re just as entertaining. The presentation is clean as a whistle and the headphones offer a wide window into the twinkling electronics opening of ANOHNI’s Why Did You Separate Me from the Earth? It’s a demanding, bottom-heavy dance track, and the Boses afford it weight and punch while managing to keep a lid on any boominess with a bass that’s deep and controlled. Discipline is applied to the rhythmic side of things too, the QC35s keeping a firm hand on the patterns underlying the grubby, crashing synths that densely populate the chorus. You can spend the whole song dwelling on the hearty hydrogenous vocals. The Boses hand them solidity and focus, and hang onto each quiver and quirk. There’s good headroom for trebly electronic sounds to express themselves, too. Library Tapes’ Feathers provides some calm after the storm, and lays the QC35s’ dynamic talents bare. It’s easy to hear the varying burdens of each piano note, which stop more abruptly than a priest at a red light, before the next one starts on cue. They’re precise in their tracks yet manage to communicate the flow and fluidity of the sequence with ease. It’s easy to hear that the Sennheiser Momentum 2.0 Wireless headphones are in a different league, though, what with their greater dynamic subtlety, bass depth and midrange insight. Just know that their noise cancelling ability isn’t quite as effective. By losing the noise and wires, and making further improvements in the sound department, the Bose QuietComfort 35s have taken the legacy range to new heights. 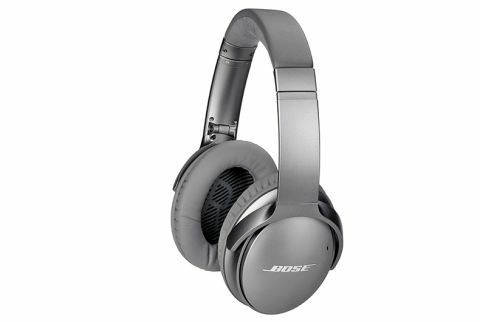 Now beaten by a new and improved the QC35 II, these original Bose wireless noise-cancelling headphones remain a good option, especially if you see a deal.